Just Mobile made a lot of headlines when it released its thick pencil-shaped all-aluminum stylus a few years ago. And now the company is following up with its brand new take on the powered and so-called smart stylus market with the AluPen Digital. It's a beautifully designed, super-sensitive aluminum hybrid stylus with an extremely fine tip designed to give you that familiar feeling of using a ball-point pen – only with your tablet or smartphone. And the great thing about the AluPen Digital is that it just works. Straight out of the box. Although it is indeed a powered stylus, there's no Bluetooth pairing or proprietary technology involved to limit its functionality so you can use it with virtually any app that's available for iOS and Android devices. Look for our full review after the jump! Putting your tablet to good use now are you? Typing away on that virtual on-screen keyboard, no tactile feedback to greet your every tap. It must be awful. Not to mention the amount of space on-screen keyboards occupy, robbing you from a true desktop typing experience. But what if we were to tell you that writing out a full essay using a tablet such as the iPad Air or even the iPad mini at a near-desktop level with nothing but an ultra-thin cover to take along with you...is actually possible. All you need is Logitech's new and updated Ultrathin (also unofficially referred to as the Ultrathin 2), the company's best magnetic keyboard cover for the iPad Air and iPad mini to date that features a built-it physical Bluetooth keyboard you only need to recharge once every three months. It's a much improved version of its predecessor the original Ultrathin – a finer tuned magnetic clip-on cover with improved viewing angle flexibility compared to its predecessor. The updated model is also thinner than its predecessor at 6.4mm (0.25-inches), which is also thinner than the iPad Air and iPad mini with Retina display. And thanks to its rigid aluminum construction, the Ultrathin 2 is also 2/3 of the weight of iPad. Sounds promising to say the least. As always, you can find our full and in-depth review after the jump! Lunatik is a brand name that has got one of the most uniquely designed accessories out there for Apple's portable devices. The company recently introduced its first ever accessory for the iPad that isn't a stylus but rather a protective sleeve. The Flak Jacket, an impossibly slim sleeve, is currently only made to fit the Retina iPad mini 2 as well as the original iPad mini with or without a Smart Cover attached to it. The concept couldn't be any more simple than that. However, Lunatik has managed to put its own creative take on the traditional sleeve concept along with a rather interesting mesh of materials. 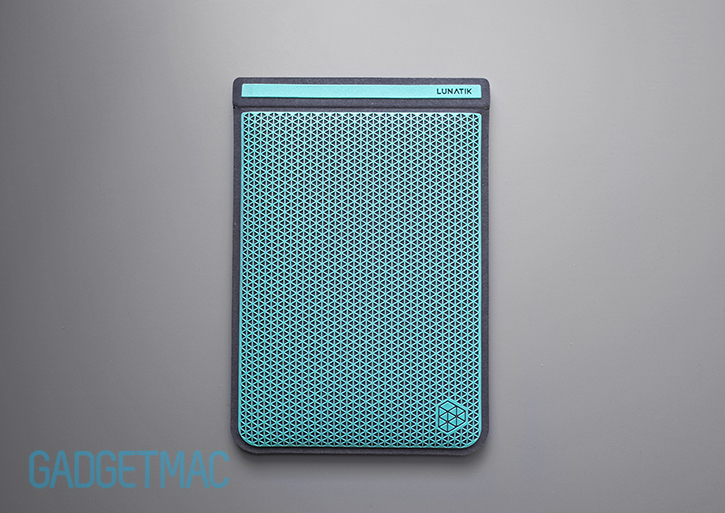 Hop past the break for a more detailed review on Lunatik's new iPad mini sleeve. If until today you thought your iPad mini was the best tablet you've ever held purely from a comfortable form factor standpoint, you were wrong. Your mind will be blown away once you get the chance to feel how awesome it can be once you slip on Magpul's new Field Case case on it. That's right, Magpul now has your tablet covered too. And you won't believe how incredibly grippy this case is, unless of course you've held your iPhone encased with one of Magpul's tactical cases. And the fit? It's just amazing, if not respectively better than the smaller Field Case variant. It's almost like it's part of the device, which is always a huge compliment to any case when it comes to the fit. Because how a case fits around your tablet makes a considerable difference between a mediocre experience and one that really puts a smile on your face. But hold on, you haven't even gotten to our full and in-depth review of Magpul's Field Case for the iPad mini and iPad mini 2 with Retina display. So be sure to tread lightly from here on out, over. 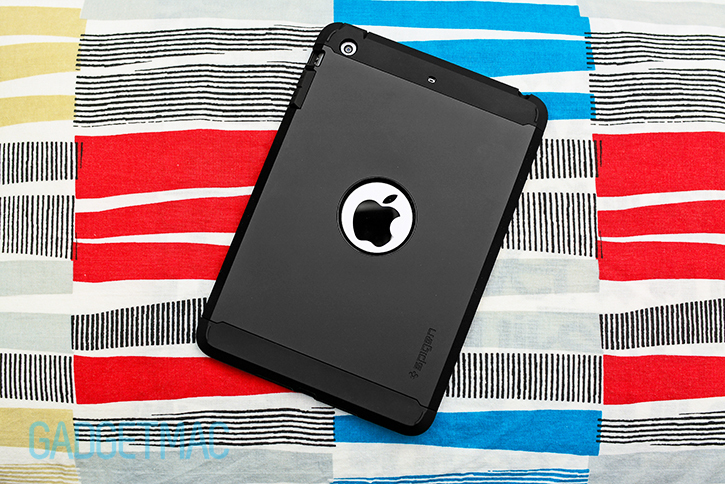 The Tough Armor case for the iPhone 5s has won Spigen our esteemed Editors' Choice Award, and now there's a Tough Armor version made for Apple's new and powerful iPad mini 2 with Retina display. Spigen's toughest iPad case ever is once again claiming that its the slimmest case that provides even more protection than other bulkier cases out there. Judging by our past experience with the Tough Armor case for the iPhone, it's easy to believe that the iPad version of it will impress no less. And in fact, as soon as we slapped it on our iPad mini we knew that it would be added to our all-time favorite cases for Apple's new powerful pico-sized tablet. With that said, the Tough Armor isn't perfect and it indeed comes with a few caveats worth reading about before pulling that quick-scoping trigger of yours. So be sure to jump over the hedge for our full in-depth review of the new Tough Armor case for the iPad mini! Calibre is one of countless names producing external backup battery packs, a name you probably have never heard of either. So what Calibre has done to make itself shine like a diamond in a the rough is create one of the more influential backup batteries that we have seen. With a first-class, ultra-clean design we swear could be based off of a leaked schematic of a soon-to-be-released Apple product, the Ultra'Go mini has already done its part in grabbing our full attention before knowing what it does and how well it does what it should do. Calibre's Ultra'Go mini is not much different from other batteries of its kind in that it'll charge just about every one of your USB-powered gizmos except that the Ultra'Go mini sells itself as the world's first ultra-compact battery pack to feature vibration signalling. A vibrating external backup battery? That's certainly an intriguing first for us. What does it all mean though? Let's get straight into the thick of it then!